NASHVILLE. 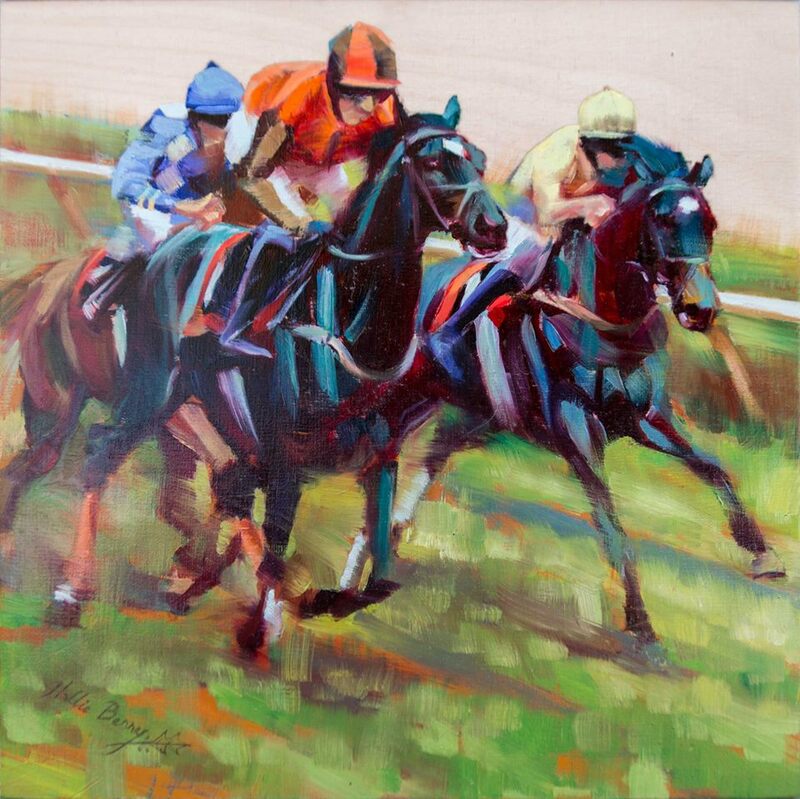 The canvas can’t seem to contain the speed and elegance of the horses Hollie Berry paints. Our eyes move with the horses and our heart pounds to see the drama, and that’s exactly the energy the artist is reaching for to capture one of her beloved subjects. Hollie Berry of Chattanooga was selected to be the featured artist at Middle Tennessee’s 2016 Iroquois Steeplechase, and her equestrian-themed oil painting ‘Endurance’ was well received. Click here to view an animation of Hollie Berry’s painterly process involved in creating this year’s featured commissioned work. The Nashville rite-of-spring takes its name from Pierre Lorillard’s beloved ‘Iroquois,’ the first American-bred horse to win the English Derby. The celebrated horse was retired to Belle Meade Plantation where he was bred to bring the next generation into the limelight. The Nashville racetrack at Percy Warner Park was built in 1936 in the rolling hillside as part of the federal Works Progress Association (WPA). Nearly 25,000 people now annually attend race day. If you missed Hollie Berry at Steeplechase, you can meet her in Chattanooga when her solo exhibit, ‘Horses: Beyond the Pastoral,’ opens in ArtSpace gallery on the second floor of Chattanooga Workspace during their June 3 Open Studio Night event from 5:30 p.m. to 8:30 p.m. The solo exhibit continues through the end of July and is open to the public Monday through Friday from 9:30 a.m.-4 p.m. and by appointment. You can purchase an original oil painting with a strong sense of place. 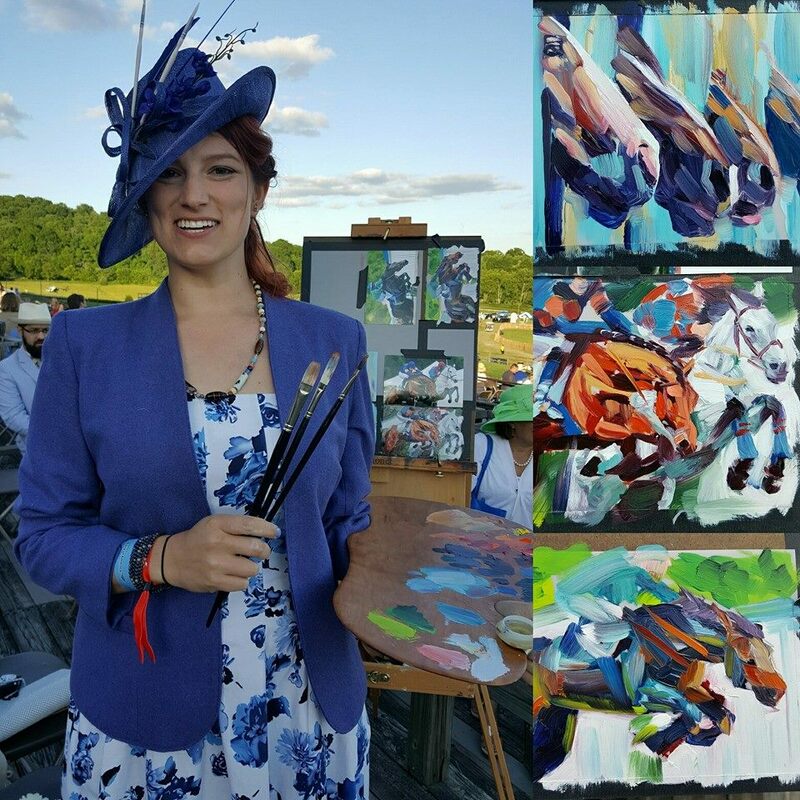 Berry created a series of equestrian-themed paintings related to the Iroquois Steeplechase and these can be viewed at her online gallery Hollie Berry Art. Berry has attended several Steeplechase events in prior years, typically spreading her quilt on the grounds and enjoying a picnic, then gathering with others at the fence to witness the intensity of the horses and blur of the silks. Many of her paintings begin with the photographs she has taken during those memorable moments, capturing how the light hits the coat of the horse. Berry’s photos inform the artist as she chooses a setting, mood, lighting, and varied scale. At the VIP Box she worked from such photographs to create small-scale original oils. ‘Endurance’ by Hollie Berry was the oil painting commissioned this year by Iroquois Steeplechase to promote race day across the region. “At the race, everything is moving—the people, the sun, the clouds, the horses, so a reference photo worked better than a plein air landscape approach to my on-site painting,” she said. One of the paintings she began at race day, ‘Muzzle Study III’ depicts several horses inside barn stalls; this painting was sold for cash before the oil paint dried. Berry’s masterpiece ‘Endurance,’ the commissioned painting used in promotion of the iconic race, was auctioned May 13, with proceeds benefiting the Monroe Carell, Jr. Children’s Hospital at Vanderbilt, in addition to supporting a Tennessee working artist. Steeplechase has netted more than $10 million for the hospital since it was designated as the event’s beneficiary in 1981. Calvin and Blythe Houghland made the charitable bid that secured the painting for their Brentwood home and the family’s superb equestrian art collection. Calvin’s father and grandfather helped establish the races, which offer a positive cultural and economic impact in the Middle Tennessee area.